A typical Zen Koan would be What is the Sound of One Hand Clapping? Lijn used this as the title for a film she made in 1975 about the Koan series of her work. Koans are tools for meditation and are used to dissolve duality. Koans are about relating the parts to the whole. Clear Red Koan are layered with elliptical coloured planes lit from within. 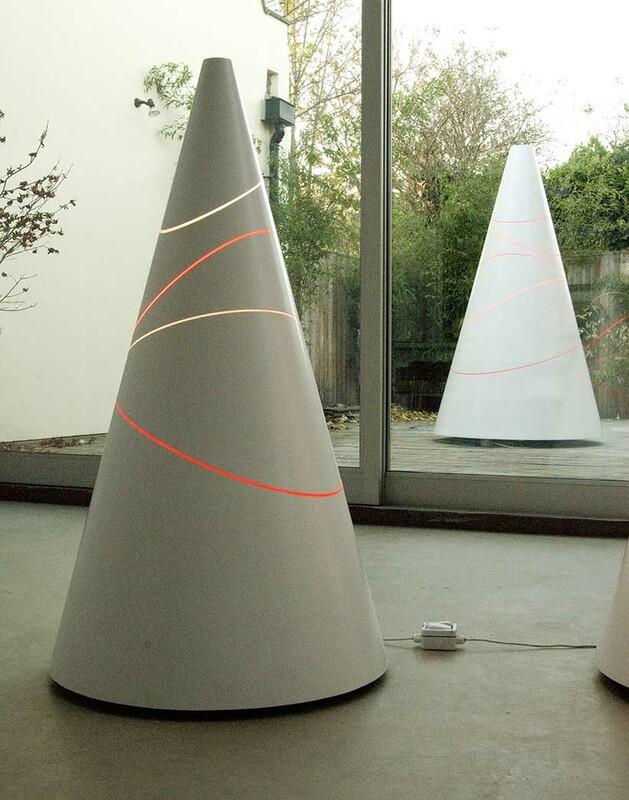 The cones spin slowly at a constant speed, so that the viewer’s eye focuses on the lines which, in turn appear to dissolve the volume of the sculpture. Although the lines appear to move through the cone, the entire cone is spinning. Each line is an elliptical plane that describes the form of the cone at the precise points at which it dissects it. Since the cone turns and the viewer remains static, the viewer is given this information in a continuous flow, unlike an object around which the viewer would have to walk, and where the viewer’s perceptions are discontinuous.